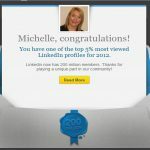 LinkedIn Top User Profiles: Am I A Cynic? Last week LinkedIn sent a massive email campaign to users with the top 1%, 5% or 10% of profile views. I received my email declaring my recognition in the top 5%. Were you amongst the lucky ones to receive one?